Monkfish's firm texture and mellow, mildly sweet taste makes a welcome addition to health-conscious diets. The fish provides beneficial minerals, as well as proteins and vitamins you need for good health. However, monkfish is also relatively high in mercury, according to the New York City Department of Health and Mental Hygiene, so it can pose a health risk to some individuals if eaten in large amounts. Monkfish makes a smart addition to your diet because it provides beneficial macronutrients. At 165 calories per 6-ounce serving, it makes up just 6 percent of the daily calorie allowance in a typical 2,000-calorie diet. Each 6-ounce portion comes loaded with 31.6 grams of protein -- 69 and 56 percent of the daily intakes the Dietary Guidelines for Americans 2010 recommend for women and men, respectively. Protein helps support muscle growth and also strengthens every other tissue in your body. Monkfish also provides a lean protein option because each serving contains just 3.3 grams of fat. Monkfish benefits your nervous system by providing vitamins essential for brain function. It contains vitamins B-6 and B-12, two nutrients that aid in the synthesis of neurotransmitters needed for brain communication. The vitamin B-12 in monkfish also promotes myelin production, a process essential for maintaining the health and function of your nerves. A serving of monkfish contains 0.47 milligram of vitamin B-6, which is 36 percent of the recommended daily intake, as well as 1.8 micrograms of vitamin B-12, or 75 percent of your daily B-12 intake needs. Add monkfish to your diet to support your metabolism -- its mineral content helps your cells regulate enzyme function. Your cells use phosphorus to control enzyme activity through a process called phosphorylation -- attaching a small phosphorus-containing chemical to proteins to turn their activity on and off according to your cell's needs. Selenium also controls protein activity, and it plays a role in muscle cell metabolism. Phosphorus also strengthens your bones, while selenium acts as an antioxidant. A serving of monkfish contains 435 milligrams of phosphorus -- 62 percent of your recommended daily intake -- as well as 80 micrograms of selenium, which provides more than your entire daily selenium needs. 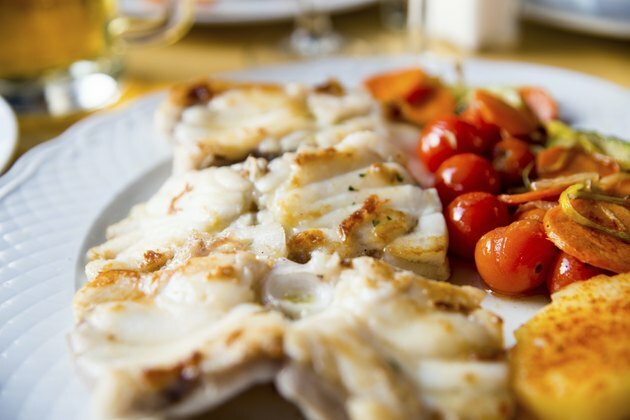 Practice healthful cooking technique when you prepare your monkfish -- avoid high-fat recipes, such as breaded and fried fish, and instead simply grill or bake your monkfish without using added oil. Pass over fat-laden tartar sauce, and season your monkfish with fresh-squeezed lemon juice and a sprinkle of cracked black pepper. Because of its mercury content, you should consume monkfish as an occasional treat instead of including it in your diet on a regular basis. The effects of mercury can prove particularly damaging for young children and pregnant women because the mercury negatively affects the developing baby. As a result, you should talk to a medical professional before feeding monkfish to children or eating it during pregnancy.